Brazil�s Literatura de Cordel is folk-popular poetry (meaning from both the oral and written traditions) which thrived in Northeastern Brazil for most of the twentieth century. It is written by humble, backlands poets or urban poets, most with very limited formal schooling, but with the �gift� of verse. The pioneers of cordel were from the Northeastern states of Para�ba and Pernambuco, and many were steeped in the oral tradition of the cantador or improviser of oral verse in the Northeastern poetic duel. The poets created their stories in verse, generally in six or seven-line strophes with xaxaxa rhyme and took them to the local printing shops. The shops printed the poems in chapbooks of 8, 16, or 32 pages, illustrated the covers with decorative type until the 1920s, postcard scenes and pictures of Hollywood movie stars from the 1930s to the 1950s, and most recently and most commonly, folk woodcuts. The poet received a share of the copies printed and sold the story-poems called livro de feira or folheto de feira in the local country fair and town and city markets throughout the Northeast. He would set up a stand displaying the booklets of verse and then sing or recite the poem to the public. The center of cordel became Recife, Pernambuco, with poets and their �agents� traveling to most of the towns in the Northeast interior to sell the verse. But because the Northeast was plagued by drought and economic hardship, the poets migrated along with millions of others to the Amazon Basin, the cities of Rio de Janeiro and S�o Paulo and finally to the new capital of Bras�lia. Thus cordel became known throughout a large part of Brazil and represents the best of the Brazilian folk-popular tradition. 2) �Traditional� popular literature, largely in a fiction mode dealing with fairy tales or love and adventure. The largest number of poems in cordel are in this mode. 3 Non-fiction (in large part) stories which report all manner of current events from the local to the international. 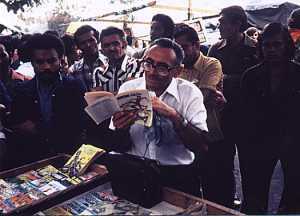 Because of the latter (n. 3), cordel became known as the �newspaper� in verse of the poor of Northeast Brazil and its poet �the voice of the people.� The current event stories now provide the main link in communication between the national media and its "recodification� in the people�s newspaper in verse.